Science is a fascinating field of study when it is connect to the scriptural truths. We believe that God is all-knowing and all-powerful. With His expansive understanding of all the scientific disciplines, He created this earth for us to live. We have identified scientific sources for study that are based on a belief in God and encourage a feeling of reverence for His creations. Science as a family project. We encourage families to work together to understand science. This allows the entire family to work on lab experiments and participate in field trips together. We provide a science course syllabus for topics correlated with each day of the creation. We encourage families to work together on group activities and for individual children to create a science notebook to demonstrate their level of understanding. The primary assignment that each student will have in their science courses is to create their own textbook. As students prepare materials to teach others about science, their knowledge deepens. Many home schoolers refer to this method as "notebooking." Primary Science: For children 0-10. Our focus is on Nature Study and children are encouraged to create a Nature Journal with the title: My Beautiful World. Beginning at age 8, we encourage families to include the home science experiments found in Science in the Beginning by Jay Wile. Elementary Science: For students 10-12. At this age, students can make the transition from learning about all the sciences in one year to a more in-depth study of each of the sciences individually. We love the new science books from Berean Builders for this age. Science in the Ancient World and Science in the Scientific Revolution provide students with a historical overview of scientific discoveries. We encourage families to consider these two resources at this age. Senior Science: For students 12-18. Students will begin creating separate science textbooks for each of the scientific fields of study. We encourage a general study of all the sciences and then allow students to select specific topics to explore in greater depth according to their interest. Science books from Berean Builders are written by Jay L. Wile, These books, which explore science from the creationist perspective, provide excellent reference material for students as students seek for information to include in their own textbooks. In addition to reference material, they also have lesson plans for lab experiments and student explore modules. In the Real Science books you will find dozens of lab experiments the entire family can enjoy. There are three levels for each course of study (Beginner, Middle School, High School). The lessons on all three levels are coordinated to allow all members of the family to participate in the lab experiment and then complete an assignment that is age appropriate. Notebooking Guidebook: Kimber Academy - The science books from Kimber Academy provide guidance for students to create their own textbook. These books offer vocabulary words, concepts, diagrams, and scriptural principles for students to include in their creative works. 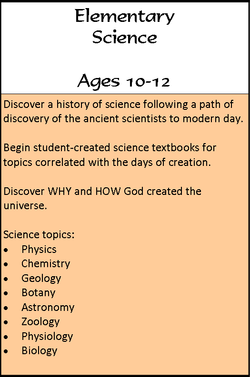 This curriculum encourages students to explore Why and How God created . . . animals, plants, people, things. Students will explore Chemistry, Botany, Zoology, Physiology, Geology, and Astronomy. Please note: Even though students will be working on one science topic at a time, it is wise to have a binder prepared for each category. Several lessons from the McGuffey Readers and the Writers Workshop introduce students to scientific principles. Written assignments from these lessons may be filed in the corresponding science binder.